We are offering Kids Running Scooter to our clients. We are foremost in company of Baby Scooter. Our presented products are made utilizing the optimum quality input and advanced technology. This is available in varied patterns as per the varied needs of patrons. Moreover, customers can avail the presented products from us at reasonable prices. 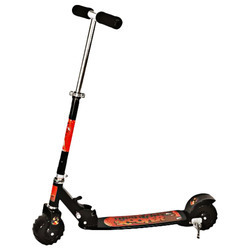 We are successfully ranked amongst the topnotch entity providing a wide range of Baby Panda Scooter. - The new "street scooter" is a roubst constructed Skate Scooter. - 125 mm PU Casted Wheels. - Safety Casing for Kids use. - Foamed Handle Grip with Mutli- colour. Specifications The NEW "Street scooter" is a robust constructed Skate Scooter. 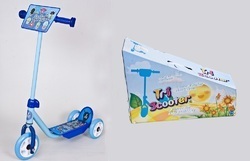 We are highly acknowledged organisation engaged in presenting the remarkable range of Roller Board Foldable Scooter. Backed with our adroit team of professionals, we are able to provide our clients with an assorted gamut of Baby Scooter.